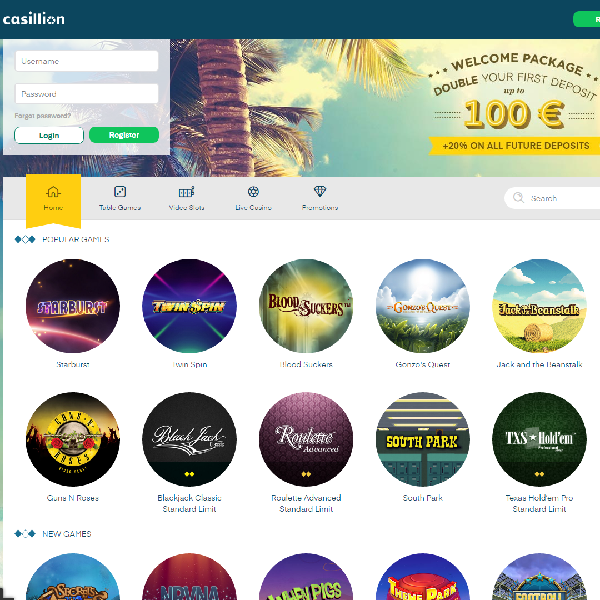 Casillion Casino is a brand new online gambling destination that gives players the feel that they are relaxing somewhere on a tropical island. The casino features games form developers such as Net Entertainment and GameArt. As such there is a wide range of high quality titles for players to enjoy. There is a vast collection of slots built on many different themes and including 3 reel and 5 reel titles. All the standard casino table games are on offer including popular variants of games such as blackjack, roulette and casino poker. There are also video poker games, live casino games and mobile games. New members of Casillion Casino are offered a 100% first deposit bonus of up to €100. The casino is licensed in Curacao and offers customer support via live online chat and email.